Malpensa Airport is conveniently located and thus facilitating easy access to the Milan city centre through various means of transport. Focus is placed on Milan because this city is a special area of interest among tourists and residents alike. Additionally, it is quite easy to travel from Milan city to any other area in Italy. There is therefore a wide range of public transportation options, and which have been adequately made available to passengers so as to meet the high demand. There is a bus service which connects central Milan to the city’s main streets which are mainly around Corso Magenta, Corso Venezia, Piazza della Scala, Porta Venezia, Via Chiesa Rossa and Viale Lazio. There are also airport buses which travel between the towns and the cities of Bologna, Chiasso, Genoa, Turin, Verona, and various others. In addition to these airport buses there are numerous other buses which ply the route between Milan city and Malpensa Airport on a regular basis. The regularity of these public buses enables passengers to make prior arrangements since they can plan to be on a specific bus at a specific time, and which in turn ensures effectiveness. These buses travel to different areas in Milan and also all around Italy. 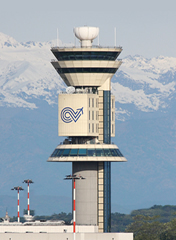 Malpensa shuttle buses ply the route between Malpensa Airport and Milan Central Station in intervals of twenty minutes. This begins at 6.00 am and ends at midnight. When travelling from the airport to the city by bus the journey lasts about an hour. There is also another bus service which travels to the Milan Gallarate Station. It operates every 20 minutes between 5.35 a.m. and 7.50 p.m.
To Milan Central Station, you can choose from two companies: Malpensa Bus Express tel: +39 (0) 2 3391 079, for €5.50 and Air Pullmann tel: 39 (0) 3 3125 8411 for €5.00. There are also taxis which are conveniently made available for passengers at both Terminal One and Two. There is also the option of travelling via train. Train services are both fast and effective. They connect Terminal One with the Milan Cadorna Train Station and numerous other stations along the way. These trains operate every half hour and have the additional advantage of being more cost-effective and pocket-friendly. The journey to the Milan city centre lasts about 40 minutes by train. From terminal T1 the Malpensa Express leaves every 30 minutes to the Milano Cadorna Station, the train stops at some other metro stations. The e-vai car sharing service, provided by Trenord and SEMS, is available 24/7 at Milano Malpensa 1. At Milano Malpensa 1 the e-vai vehicles are stationed near the Malpensa Express ticket office, with 4 vehicle places and 2 columns with 4 top-up payment stations. The tariff is €5 with no additional mileage costs for electrical vehicles and €2.40 per hour plus €0.48 per km for low impact endothermic vehicles. The stations are staffed Monday through Friday from 8 a.m. to 7 p.m., Saturday and Sunday from 10 a.m. to 6 p.m. The service is active 24/7. To move between Malpensa 1 and Malpensa 2, there is a free shuttle-bus service in operation 24 hours a day, with departures every 7 minutes during the day and every 30 minutes at night (from 10.45 p.m. to 5.15 a.m.).